Inland is pleased to share that they have been awarded Packaging Materials Supplier of the Year by MillerCoors. Winners were announced at MillerCoors’ corporate headquarters in Chicago. 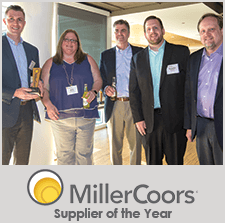 On May 16th, MillerCoors Procurement held its annual Supplier Recognition Awards event. The purpose of the event is to recognize the excellence of MillerCoors’ most valued suppliers. Inland was one of 10 different suppliers that were honored for exemplary performance in key strategic categories. This is the 7th Supplier of the Year award Inland has received from MillerCoors since Miller Brewing Company and Coors merged in 2008. Prior to that, Inland won 5 supplier awards from Miller Brewing Company and 5 from Coors Brewing Company individually.